Our hands are complex structures consisting of bones, muscles and tendons. If they need to be rested for any reason, certain activities, such as working at the computer, which is actually relatively light work, become a real challenge. 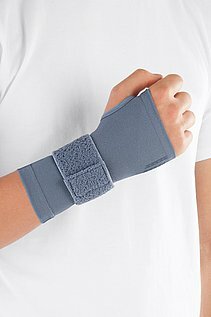 Overstrain of the wrist can lead to irritation and tenosynovitis. 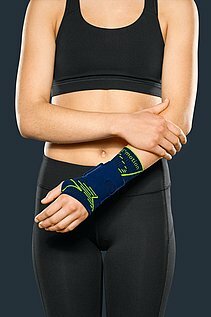 This is where medi's wrist supports help: they exert specific pressure on tendons and muscles in the forearm. In this way, they relieve stresses and strains on the muscular apparatus and relieve pain. Supports immobilise the wrist and/or joint at the base of the thumb for a certain period of time. They can relieve, support or stabilise, depending on the medical diagnosis. 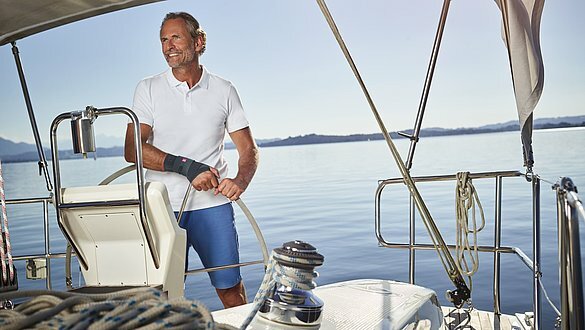 Supports also promote regeneration of the joint after injuries or after an operation. 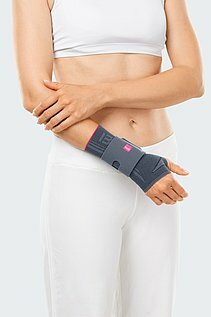 The wrist supports from medi are used for a variety of different clinical pictures. For example, they relieve stresses and strains after an operation on the joint and, in turn, activate mobility of the hand during the regeneration phase. They ease the symptoms of arthritis and osteoarthritis as well as a chronically irritated wrist or after a sprain. The antibacterial material and the special fabric and fastener design in the bend of the elbow ensure that the support fits comfortably. This means medi supports remain comfortable to wear, even when used for longer periods of time.